Yogurt Fruit Dessert for Kids. Surprise them. We are always trying to get our children to eat healthier foods and develop good habits that will last a lifetime. In the busyness of our daily lives and our quest for food that is faster and faster, we forget that children eat with their eyes first, as do we. A bowl of plain white yogurt is unappealing for me to look at. Imagine a child viewing it for the first time. The following dessert has great appeal to children and is without all those chemical ingredients and preservatives found in the grocery store. Try it, they'll like it! What child do you know that wouldn't love to take a bite out of this Yogurt Fruit Dessert? The small amount of colorful, sweet non-pareils will entice them to try a bite of the yogurt on top, softly sweetened with a little natural honey enticing them to continue down the glass. Choose fruit that you know have the flavors and textures that are appealing to them and you will have a healthy snack or dessert anytime! 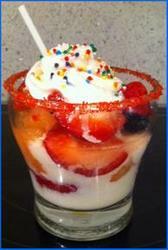 Yogurt Fruit Dessert for Kids! Orange, Banana, Strawberry, Apple Bits, Cherries or Peaches are usually good choices. Plain Yogurt and Honey. Mix together well. If a little more sweetness is desired, add more Honey or 1 Tbs Orange Juice. Please be careful about the consistency; most kids will like it better with a texture closer to soft serve ice cream than runny. Refrigerate for a few minutes (or longer) while you prepare the fruit. Cut into small bite sized pieces the fresh fruit you have chosen. There is no limit to the combinations and flavors you can develop with this Sweet Treat. To reflect tropical flavors we used strawberries, bananas and orange bits with a couple of blueberries for a color pop. Be careful, some blueberries are very sweet and others are not. Next time we will sprinkle a little coconut over each layer. As a snack, a little finely chopped granola could be used to add a little crunch. 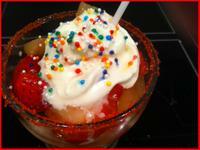 Sugar Rim: To rim the glass with sugar, sprinkle the Decorators' Sugar, any color that you like, onto a plate (we use paper plates for this purpose). Wet one finger and run it around the perimeter of the glass you are using. Then tip the rim of the glass into the sugar and turn it a couple of times. If you miss a couple of spots, simply re-wet those spots with your finger and repeat. To assemble, begin with one to two spoonfuls of flavored yogurt, then add a layer of fruit, then yogurt. Continue layering until your glass is full, ending with a layer of fruit. So, so good. And better yet, so good for them!